But also something more. You understand there is something outside yourself that has to be served. And when that need is gone, when belief has died…what are you, eh? A man without a Master…the Ronin could have hired themselves to new masters, they could have fought for themselves…but they chose honor, they chose myth. Understanding there is something outside myself that has to be served. Most people don’t, but do it anyway. Most don’t understand that there is something outside themselves that has to be served, and yet they serve something – even it is their selves. I might fain serving something big and honorable outside myself, but usually it is small and meaningless. And like any other small and ultimately meaningless trifle, when that need is gone, when belief has died…what am I, eh? A man without a Master. 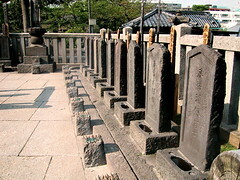 The Forty-seven Ronin were Samurai who after being betrayed and failing to protect their Master, became master-less Samurai, disgraced by another man’s treachery. For three years they plotted, pretending to be something they were not, in order to slip into the castle of their lord’s betrayer to kill him. What I am left with then is the question I imagine the Ronin were left with: what now? They chose seppuku, suicide, seeing in it honor. I am far too Western to go that route. I know there is something more, and that the warrior code and delight in battle doesn’t die when I find the battles fought were mere skirmishes, and the master I served was not the One I was made to serve. I know too what it is to pretend to be something I am not, in order not to get caught. But mine has none of the wisdom behind it that the Ronin had – in order to serve a higher purpose. And to fight for myself..well, that isn’t too far off the mark of what I have been doing all along, now, is it? Maintaining the status quo is a death, is a suicide. What must have gone through the minds of those former Samurai after they had achieved the redemption of their honor by slaying their Master’s enemy? They had nothing left to live for. To go back, to serve their selves – all this would be less than where they had come to now. And though it might have seemed honorable and mythic, seppuku was nothing more than an inevitable result of a belief that has died. Belief in small things has died. But the belief that there is something bigger, that it doesn’t end here, and that to become mythic has something to do with serving something outside myself that does not die…that keeps me from any other inevitability. Though it does not answer the question, just gives light for another day, hope.